The Senate Higher Education Committee on Wednesday considered several bills related to limiting tuition increases. Editor's note: This story has been updated throughout after the Senate Higher Education Committee met on Wednesday. Ever since the Texas Legislature gave public universities the right set their own tuition in 2003, there have been attempts by lawmakers to revoke it. On Wednesday, the Texas Senate began working on this year’s try. The Senate Higher Education Committee considered five bills that would halt, limit or slow tuition increases in the coming years. Each one’s aim, their authors said, is to get control of fast-rising college costs. Average tuition and fees at public universities have climbed 148 percent in the past 15 years. Each of the bills — some are written by Democrats, some by Republicans — has a unique plan to address affordability. Committee Chairman Kel Seliger, R-Amarillo, said after the meeting that only one will probably make it through the committee. “I see no way that you could have two of these in effect,” he said. No winner was picked Wednesday, however. A vote could come in as soon as a week. “Something, I think, will probably pass this time,” Seliger said. Seliger’s favorite appears to be Senate Bill 543, which is no surprise as he is the senator who wrote it. The bill would allow universities to raise their tuition only if they meet six of 11 performance metrics set by the Texas Higher Education Coordinating Board. Those metrics would touch on schools' administrative costs, graduation rates and the number of degrees awarded. It's a slight twist on a coordinating board call for performance-based funding, which would tie state funding to performance metrics. Tuition increases allowed under the plan would be limited to 1 percent for the first two years, and then 3 percent plus inflation after that. But the concept has drawn skepticism from some higher-education leaders, who have questioned whether tuition increases should be considered an award for good performance. The idea has the interest of some influential lawmakers. A similar bill passed the Senate in 2015, only to die in the House. The chairman of the House Higher Education Committee at the time, state Rep. John Zerwas, R-Richmond, has since expressed regret that the lower chamber didn't look more closely at it. Early in the current session, Zerwas said he'd like another chance to consider the idea. Since then, however, he has transitioned to lead the House Appropriations Committee. The new House Higher Education Committee chairman, state Rep. J.M. Lozano, R-Kingsville, hasn't publicly weighed in on what the legislature's role should be in limiting tuition issues. Seliger was optimistic about its future after Wednesday’s meeting. “Clearly, the performance-based tuition increase passed last time, and it probably seems to have the broadest appeal both to legislators and institutions,” he said. 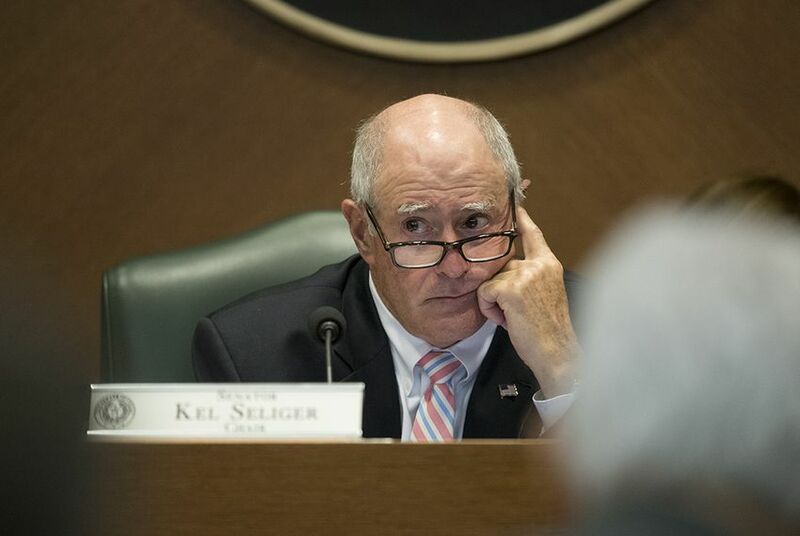 Another bill by Seliger, Senate Bill 19, will likely get strong consideration, too. It would force universities to charge no more in tuition and fees than they do now for four consecutive school years beginning in the fall of 2018. Schools could technically increase tuition for next year, but they would then have to lower it back down the year after. It also has the endorsement of Lt. Gov. Dan Patrick, who listed it among his top 25 priorities in the current legislative session. It's unclear how the proposal would fare in the House, however, where attempts to freeze tuition have been greeted less favorably in the past. State Sens. Charles Schwertner, R-Georgetown and José Rodríguez, D-El Paso, are leaving the door open to future tuition increases, but only with permission. Schwertner, who is perhaps the most outspoken critic of high tuition in the Senate, has proposed a law that would ban tuition increases for one year, and cap them at the rate of inflation after that. He said Wednesday that student fee increases would have to be approved by a student election. Rodriguez's bill would simply prevent schools from setting tuition at a higher rate than what they charge for 2017-18, unless the Legislature approves it. Those ideas might be worrisome to universities, which have argued that one of the main reasons they have raised tuition in recent years is to make up for the shrinking per-student state support for higher education. What's more, universities could be hit with big state funding cuts this year. If it were tougher for those schools to raise tuition, officials there would be limited in the ways they could make up that money. “Our concern from the University of Houston is that the tuition freezes and limits being imposed might actually hurt the students that they are meant to help,” said UH Chancellor Renu Khator, explaining that an inability to raise revenue through tuition increases might prevent the school from hiring faculty, career advisers and mental health counselors. Similar bills have been filed in the past, including by Schwertner, but have failed to make it to the governor's desk. State Sen. Judith Zaffirini, D-Laredo, has proposed a solution that acknowledges university leaders' concerns. Under Senate Bill 1323, universities would be banned from raising tuition except to "to make up any difference between core operational costs and state formula funding appropriations." The bill would require the state's Legislative Budget Board to review universities' core costs every two years, and then require universities to come up with detailed plans to reduce those costs by 5 percent. Zaffirini noted that basically the same bill passed the Senate in 2009 but that she wasn’t hopeful for 2017. “If I thought the bill were going anywhere, I’d have” a few changes to make to it, she told the committee. Texas families are struggling to pay for college — but so is the state. As tuition goes up, state-funded financial aid doesn't go as far as it used to. Universities face funding cuts of 6 percent to 10 percent in Senate plan.